Since discovering the broiler secret to getting crispy potatoes, I have recently found an even better, and more sure fire, way to getting restaurant worthy fries. Sure fire in that you won’t end up burning parchment paper or the potatoes to a crisp. It’s not as fast, but – sometimes – taking it slow, taking it easy is the best way to go. I’ve also discovered that the broiler is really not so much the secret to getting crispy fries. The trick to getting these potato fries crispy and that golden brown colour is to lightly coat them in oil. Any oil will do, I use olive oil without getting any distinct olive-y flavour or aftertaste. I realize that that’s why my past attempts (excepting the broiler ones) at homemade fries wasn’t working. I simply just put the potatoes in the oven. It may sound obvious but it really did not occur to me back then. Thank heavens I’ve found out – now I get groans and people telling me not to show me the pictures since it reminds them of White Spot and makes them want to eat fries, with or without the ketchup. P.S. Nail polish is “Sparrow Me the Drama” from OPI’s Pirates of the Caribbean: On Stranger Tides collection. Would you agree that it’s a match, or at least close, to Maggie’s refined sugar-free frosting? Use one potato fry to spread and coat the parchment paper with about a tablespoon of oil (I always eyeball it). 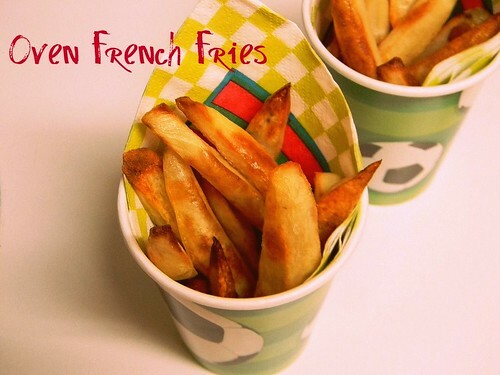 After you’ve done that, arrange the rest of the fries on to the parchment paper-lined pan. 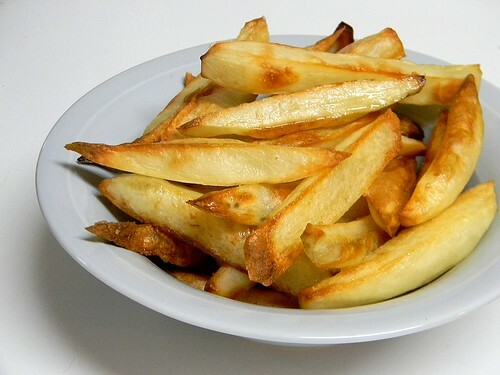 Toss all the potato fries in a light amount of oil in a bowl before arranging on to the prepared pan. 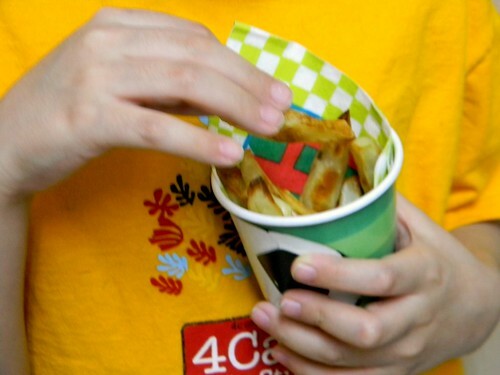 Brush the arranged fries with the oil using a pastry brush, if you have one. Sprinkle with a light amount of salt and bake for 25 minutes. Keeping the oven on, take the fries out and turn. Pop back in the oven for a further 10 minutes. 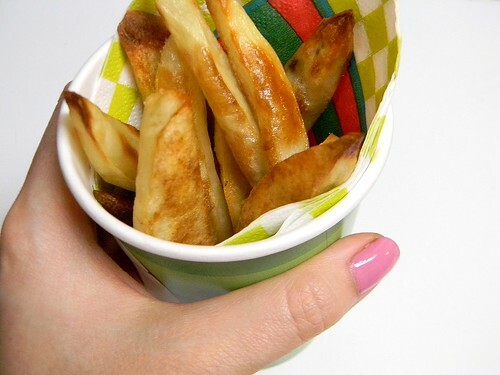 Turn off the oven and turn on the broiler, set on low, and broil the fries for 2 to 3 minutes. Remove from the broiler/oven and cool. These look great! I haven’t made fries at home in a long time.. Think memorial day weekend is a perfect time to try your technique! Hi Raj, I could easily clear a tray of these even without ketchup! 🙂 One day I’m going to make a large batch to go along with my grandmother’s sliders next time she makes them. YUM, Zoe! I’m weak for good oven fries. 😉 I use a recipe called the Ultimate Oven Fries. They take longer, but they are worth it. In that recipe, the “secret” factor is soaking potatoes in cold water before cooking. I’m definitely willing to try your recipe and do a taste test though! Love the new nail polish color and that you shared the info! People always want to know what color you’re modeling, so good idea to go ahead and tell us! And fun that the color matches Maggie’s cupcakes. 🙂 Since her son is into pirates, he will love hearing about that connection! All the colours in the Pirates collection are great! Sharing info like nail polish colour seemed a little superficial to me before, like back when I was just starting to blog, especially when this is a food blog but I’m starting to appreciate that side of me now, at least now in an online setting. I adore you Zoe! I really need that nail colour! This is how we make our fries, at least once a week! The presentation isn’t quite so good, but I’m sure they taste almost as good as yours. I’ve been sprinkling about a tablespoon or two of nutritional yeast on ours and oh my yum! Thanks, Maggie! You’re so sweet. 🙂 My family hasn’t really used nutritional yeast (we bought it once, years ago, before we changed our diet around but never really used it, at least to my knowledge), though your variation sounds wonderful!